Also, on Sunday, we’ll all gonna welcome Stretch back from captivity at 13:00 WST. In addition to that, the five dinos that make it onto the Monster Board the most times this weekend, will receive this limited edition Dead Stretch Cave Item! Comments Off on Attack Weekend! 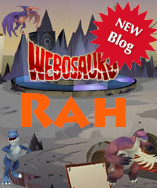 This Saturday (October 22nd) will be a BIG day for Webo, because it’s Webosaurs’ Second Anniversary! That’s right! And what’s even cooler is that we will be celebrating this event for two whole days! Join us all this Saturday at 12:00 WST and Sunday at 14:00 WST in Rumble Rocks Cave (Prairie Pool)! Everyone who attend either day, will get the awesome new Anniversary Cake! In addition to that, we’re expecting some special “old-school” guests to attend the Anniversary parties! 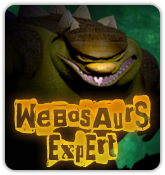 If that’s not enough, we’ll all get the chance to win loads of XP by hitting Spike with a pumpkin and taking a picture. Dinos can make as many pictures as they want, as long as they’re in different rooms. Then, you can send the pictures as a comment on the blog, or as a reply here. The reward is 500XP per picture. 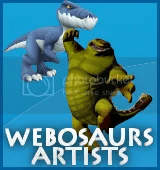 Comments Off on Webosaurs’ Second Anniversary!